The preservation of computer and information processing heritage has, for the most part, been neglected, and many important artefacts and much information has already been irretrievably lost. This loss will severely hamper any future historical studies. The computer or information processing industry is one of the youngest, with two overlapping eras of approximately 60 years each: the mechanical, punched card era ushered in by Hollerith in the last decade of the 19th century; and the electronic computer era, with its earliest beginnings in the work of Konrad Zuse, amongst others, in the late 1930's and early 1940's. The punched card era is, relatively speaking, quite well off in terms of the historical record. Many hundreds and thousands of machines were built and used over many decades, and representative examples exist in many museum and private collections. Further, the mechanical nature of the machines and the media used makes the interpretation of their use fairly apparent once the basic principles have been mastered. The electronic computer industry, despite its relative youth, has lost much more of its heritage. It has passed through multiple technologies in its brief 50 year span: from electronic valves to large scale integrated circuits by way of transistors and small and medium scale integrated circuits. Many different generations of computers have seen their day: mainframes, minis, and micros. Software, the ephemeral component, has also seen a vast change in scale and complexity. The youthfulness and ultrarapid change in the industry has resulted in many historical artefacts being lost and/or destroyed due to lack of foresight on the part of the participants and their enthusiasm to ''move forward''. Many of the earliest computers were built as one off special projects and were quickly dismantled when their successors were developed and built. In some cases, successor machines were built, in part, from the components of the previous generation. Even manufactured computers were often built in quantities of only a few tens or at most hundreds per model type; technological advancement made their continued manufacture uneconomic even while customers continued to use them, sometimes for many years. Software was continually upgraded and improved and the older versions discarded like the old rags that they had become. Whereas physical artefacts have been preserved to some extent, the same cannot be said of the software, or programs used to make these machines live; Listings, paper tapes, punched card decks, magnetic tapes and system manuals are often the first things to be discarded. Disposing of a large mainframe computer is, by comparison, a significant effort. Even where punched cards, tapes, or magnetic media have come down to us we are usually unable to read them, because the machines needed are either no longer available or do not function. But reading the data is not even enough. We must be able to decipher the bits and understand how they were used in their original form. A small but passionate group of technicians are working to partially reverse this trend before it is too late. The Internet has allowed this effort to be loosely coordinated, despite the fact that the participants come from all part of the world. For the most part, these projects are carried on by private individuals; very little of the preservation work is being done by any of the few institutions existing in the field. One group member in California, USA scans thousands of pages of computer manuals he personally acquires, sometimes at great cost, and makes them available over the internet. Another, in Massachusetts uses that information to write emulators for the long gone machines which in turn allows another group member in France to actually restore to working state a 30 year old computer. 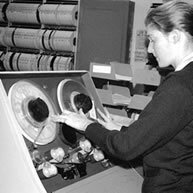 That working computer now provides the means of recovering magnetic tape media, making possible the restoration of working copies of software thought to be long lost. Files recovered also provide valuable information supplementing the documentation archives. Running the recovered software on the emulator allows correction of discrepancies between the emulator and the real machine, making it a better tool for future research. The network is fluid and fragile, depending on the personal interest of the participants and their generous donation of time, effort and real world resources. Any part can be potentially lost due to the changed circumstances of a participant. Sometimes valuable web sites simply disappear, occasionally to reappear at a later date and different form. What is needed is institutional coordination and support of this effort. This must be provided in such a way as not to suffocate the efforts of the individual but to liberate and magnify them. Much remains to be done, vast areas of the historical record remain to be explored, and all the work must be catalogued and archived to ensure its permanent preservation.